Inspired by the works of Jane Austen, the amusingly tongue-in-cheek Mr Darcy’s Guide to Courtship is written from the perspective of Pride and Prejudice’s Mr. Darcy and closely based on real Regency advice manuals. It is a hilarious and irreverent picture of the social mores of the period and of how men thought about women – and sheds amusing light on men of the modern age, too! 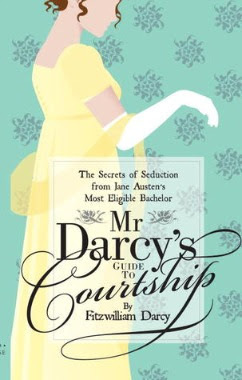 Readers can dip into different sections for Darcy’s views on a myriad of issues, including “What Females Want”, “The Deceptions of Beautiful Women” and “Winning Their Affections, Flattery, Making Conversation, and Flirting!” Also included are sections written by Pride and Prejudice’s Miss Caroline Bingley and Mr Darcy’s correspondence with famous Regency figures including the Duke of Wellington. The guide covers all the important aspects of courtship, such as how to make oneself agreeable (even when you don’t have neither looks nor money to recommend you), how to select a suitable spouse and win her hand, and how to recognize and thus avoid rakes and fortune-hunters. Furthermore, Mr Darcy enlists the help of his old acquaintance Miss Caroline Bingley, who shares beauty tips, and Miss Maria Betrand, who explains how to turn down an unwanted marriage proposal. At the end of the book, there is a Q&A section where Mr Darcy answers some of the letters his readers have sent him, including one from a certain Mrs B who is desperate because she has five marriageable daughters that are still single. The guide, which is extensively illustrated, is written in a very satirical tone, and draws his information from Regency’s advice manuals. Therefore, if you’re expecting Darcy’s advice to be modern and romantic, you’ll be highly disappointed. The Mr Darcy who penned this guide is very much a man of his time, imbued with the prejudices of his era, including the belief that women were inferior to men (we can only hope that Lizzy made him change his mind about that). This Mr Darcy is pretentious, cranky, aloof, at times arrogant, but still very charming. And his guide won’t fail to entertain you. Full of useful advice, beautiful pictures and even a couple of tests, Mr Darcy’s Guide To Courtship By Fitzwilliam Darcy is a funny guide to the world of Regency courtship. The guide, which draws its information from the advice manuals of the time, is written in a satirical style and is highly entertaining. Available at: Amazon UK, Amazon USA and Barnes & Noble.